The Milwaukee County Zoo is proud to announce details of a reticulated giraffe birth which occurred the morning of September 16. The last giraffe birth at the Zoo was in 2003. 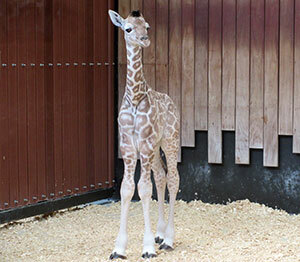 The male giraffe calf was born to first-time mom Ziggy, and first-time dad, Bahatika. On September 17, veterinarians completed the calf’s first exam, and recorded a weight of 157 pounds, and a height of 5 feet 9 inches tall. Zookeepers have been monitoring mother and baby; Ziggy has been very attentive to the calf which is nursing regularly. Ziggy is 5 years old, and arrived at the Milwaukee County Zoo in 2013 from Disney’s Animal Kingdom. Bahatika is 10 years old, and arrived here in 2006 from the Cheyenne Mountain Zoo in Colorado. In the wild, giraffes are found throughout the savannas of Africa. They walk around, often with birds on their backs. These birds are called tickbirds. They eat bugs that live on the giraffe’s coat, and alert the animals to danger by chirping loudly. Although not threatened by extinction, the wild giraffe population is less than 80,000 and decreasing; but exact numbers are uncertain.